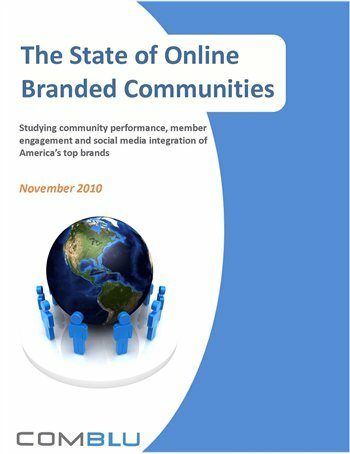 I wanted to write a great blog post to go along with the release of this study by ComBlu on the state of online branded communities but given my current workload, it isn’t going to happen today. HOWEVER, I really want you to know about it and more importantly, download it so you can dig deep for insights that can really make a difference for you or your clients. I don’t normally do this but today I am simply posting the press release. I’ll come back in a day or so with my own thoughts. Hats off to ComBlu for caring about online communities and embarking on such an important endeavor. Thanks to Peter over at ComBlu for giving me an opportunity to review the report a week before its release. I assure you there is more to come. Chicago, Ill., November 10, 2010—A new study of 241 online communities from 78 major corporations found that 33 percent of the brands are using a cohesive approach to social engagement compared to only 20 percent in 2009. It also shows much tighter integration between a brand’s sponsored community site and its other social assets such as Facebook, Twitter and YouTube. This research is the second annual “State of Online Branded Communities” analysis conducted by ComBlu, a Chicago-based marketing organization specializing in social engagement initiatives. The study’s purpose is to closely examine and quantify the effectiveness of these communities in providing meaningful customer experiences, integrating brand strategies across multiple social media channels, and applying best practices to strengthen customer engagement. For example, the study found that only 20 percent of the communities have an advocate or experts group, which represents the “voice of the customer,” contributes content and helps recruitment. Nearly half of the communities do not have a visible, active community manager who is the “face” of the brand and makes interaction more personal. Fewer than 40 percent of the communities that ComBlu joined have any rewards or recognition programs, which are key drivers for sustaining participation. As in 2009, nearly half of the brands are still in the experimental phase. Brands are doing a better job delivering diverse engagement experiences; 76 percent use strategically-aligned engagement tools compared to 28 percent in 2009. The Top 10 performing brands are American Express (48 points), EA (47), Discovery Channel (45), Hewlett-Packard (45), Sears (44), Verizon (44), Activision (44), Kimberly-Clark (44), AT&T (44) and Sony (43). Of the 12 industries in the study, the highest scoring are Gaming, Entertainment, Technology and Telecommunications. Does online community outsourcing work? Firms that lack leaders with social media skills are often tempted to outsource community management to outsiders, such as web development firms or advertising agencies. Unfortunately, this increases the risk of failure. The problem is that when community development is outsourced, the organization doesn’t learn and people inside communicate like they always did, even though the use of social media might have speeded up internal communication and flattened the hierarchies. As a result, the company is often very different from the face it portrays online, which almost always gets discovered. I’m not completely sure what my opinion is on this even as I type, because whatever it is, I know it’s not firm. I do agree, however, that when community management is outsourced, organizations do not learn. But I also know based on the work I do that there are many out there who don’t want to learn, so they probably don’t see that as an issue.Is there anything wrong with not wanting to learn anything about managing a community? Maybe. Maybe not. Someone posed the question on twitter early last week about outsourcing moderation and I tweeted my disagreement, but then thought about it a little further as the conversation ensued. Actually, it really depends on what type of content is being moderated. If it’s a forum that has clear guidelines and very little controversy, it’s probably not that big of a deal. My moderation experience is rooted in news, so that is why I was so quick to disagree. When I hired and managed a team of moderators for WRAL.com, it was very important to me that they understood the news, the content associated with the comments they were moderating and general familiarity with the regular posters, as well as the related stories. Now, that may not be required for other websites. I did some contract work moderating a forum associated with a popular children’s book series over the summer and knowledge of that series was not required because the guidelines were clear. So for them, it works.It’s also important to note that their outsourcing is with a very reputable company that has experience in the space and contracts with the right people to do the job. So, they did their due diligence in selecting this company for outsourcing. But I think there is a distinction to be made for overall community management, and it makes sense for someone internally to own it . I don’t think that failure is imminent if this isn’t the case, but an internal advocate is important. I do think that agencies can handle community management if they have someone on staff with that kind of experience. But given the fact that it is a full-time job in most cases, this could be a costly endeavor for the companies doing the outsourcing. The issue that must be revisited, is whether or not the company really wants a community. Many say they do, but their idea of community can range from a group of brand advocates who spread good cheer about them all over the web to a forum where visitors can ask questions and wait for them to respond. We can debate all day on whether either qualifies as a community. At any rate, the post that sparked the idea for this one is a good one. I only shared one part of it. So go on over to the Harvard Business Review and read it. …and I’d love to hear your thoughts on outsourcing.